The federal government’s over-the-top police action against the Bundy family ranch is an ominous portent of more to come, as rogue agencies and their corporate/NGO partners attempt to “cleanse” the West of ranchers, farmers, miners, loggers, and other determined property owners. On Saturday, April 12, the federal bureaucrats backed down. Faced with hundreds of men and women on horseback and on foot who were armed with firearms and video cameras — as well as local television broadcast stations and independent media streaming live video and radio feeds across America — the Obama administration called off the Bureau of Land Management’s (BLM) operation to confiscate hundreds of cattle belonging to Cliven Bundy, the current patriarch of a respected pioneer family that has been ranching in Nevada’s Clark County since the 1800s. Supporters from all across the United States had converged on the Bunkerville, Nevada, area in support of Bundy, who is the “last rancher standing” in Clark County, due to a decades-long campaign by federal agencies and allied enviro-activists to drive all ranchers off of the range. After a tense standoff, orders came down from above for the surrounded and outnumbered federal agents to “stand down” and turn loose the Bundy cattle that had been corralled. On Saturday, before the resolution of the standoff, The New American talked to Richard Mack, the former sheriff of Graham County, Arizona, and founder of the Constitutional Sheriffs and Peace Officers Association (CSPOA), as he headed from a meeting of public officials to a press conference at the Bundy Ranch. He was very grave and worried at the time that the situation could spin out of control, and that federal agents might open fire on citizens. He also expressed his exasperation at Nevada Governor Brian Sandoval and Clark County Sheriff Douglass Gillespie. “If Governor Sandoval and Sheriff Gillespie were doing the jobs they were elected to do, they would have stopped this from getting to a dangerous point,” Sheriff Mack said. “There are lots of things they could have done to defuse this situation, including telling the Feds to ‘stand down,’ and to assert their own jurisdiction and force the federal authorities to obey the law, including the Constitution and the laws of the state of Nevada,” he noted. “I have a very bad feeling about this,” he continued, adding that he hoped the tensions would be deescalated and a peaceful outcome negotiated. Fortunately, most likely due to the national attention that the Bundy situation was receiving, federal officials backed off, the demonstrators and supporters remained peaceful, and a violent confrontation was averted. However, that does not end the affair. Members of the Bundy family and supporters, such as Sheriff Mack, expressed concerns that the evacuation of the federal police force might be a feint, and that there may be plans for them to return the following day, or as soon as the supporters and television crews had departed. Senate Majority Leader Harry Reid, whose personal financial stake in the Bundy eviction has been called into question, let it be known that he wants to see the matter pursued. Senator Reid, Nevada’s senior senator, is very incensed when the American people, i.e., ordinary citizens, “violate the law” — as he puts it — but he says nothing about the more serious violations of the laws and the Constitution by public officials, such as himself or the BLM officials. This is the same federal BLM that Chief Judge Robert C. Jones of the Federal District Court of Nevada last year ruled had been engaged in a decades-long criminal “conspiracy” against the Wayne Hage family, fellow ranchers and friends of the Bundys. Among other things, Judge Jones accused the federal bureaucrats of racketeering under the federal RICO (Racketeer Influenced and Corruption Organizations) statute, and accused them as well of extortion, mail fraud, and fraud, in an effort “to kill the business of Mr. Hage.” In fact, the government’s actions were so malicious, said the judge, as to “shock the conscience of the Court.” Judge Jones granted an injunction against the agencies and referred area BLM and Forest Service managers to the Justice Department for prosecution. Has Attorney General Eric Holder prosecuted any federal officials for criminal activity and violation of the Hage family’s constitutionally protected rights? No. Has Sen. Harry Reid denounced this lawlessness and criminal activity by government officials and call upon President Obama and Attorney General Holder to protect the citizens of his state from the depredations of federal officials under their command? No. With attitudes such as those expressed above by Sen. Harry Reid, it is almost a certainty that the recently defused Bundy Ranch standoff will be replayed again — and in the not-too-distant future. And the outcome could be much less amicable for all concerned. And this is but one of many incidents that can be expected, because the Bundy family are not the only victims in the federal crosshairs. The BLM, U.S. Forest Service (USFS), National Park Service (NPS), U.S. Fish & Wildlife Service (USFWS), U.S. Army Corps of Engineers (USACE), and other federal agencies own and/or control hundreds of millions of acres of the 12 western states. The federal Environmental Protection Agency (EPA) is not as large a landlord as some of these bigger agencies, but it exercises enormous regulatory clout over both private and public lands, air, and water. And while the EPA’s draconian, arbitrary, and costly regulations affect the entire country, they fall especially hard on the states in the West, where the federal impact is already massive due to the outsized footprint of the federal agencies. 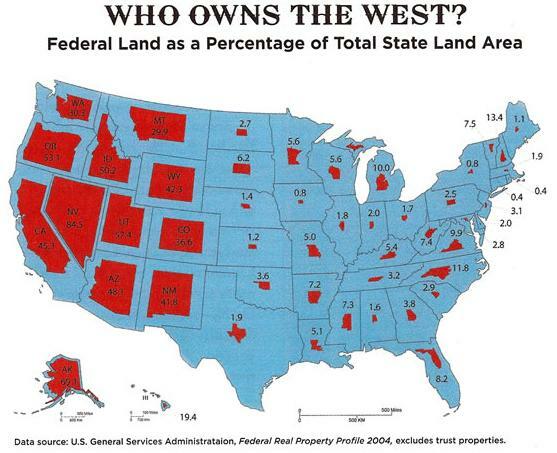 As the accompanying map graphically demonstrates, there is a striking difference between the federal government’s claim to physical real estate in the states of East and the Midwest versus those of the West. In Maine, for instance, federal agencies occupy only 1.1 percent of the state’s land area; in New York it’s a mere 0.8 percent. The federal government claims only 1.8 percent of Indiana, 1.6 percent of Alabama, and 1.7 percent of Ohio. But in the Western states, the federal footprint covers from nearly one-third to over four-fifths of the area of the states. These and many more relevant statistics can be found in Federal Real Property Report for Fiscal Year 2012 (the latest available) from the U.S. General Services Administration (GSA). For instance, in addition to its enormous real estate portfolio, the U.S. Department of Interior (home to BLM, NPS, USFWS) boasts 43,554 buildings covering more than 107.1 million square feet. These agencies, together with the Forest Service, exercise an enormous — and harmful — impact on the economies, livelihoods, and politics of the Western states. And, contrary to the claims of the federal advocates, federal policies are also taking a devastating toll on the environment of the West, most especially as manifested in the destruction of millions of acres of national forests through mismanagement, which has led to immense insect infestations and super-nova wildfires. Because this has been the “normal” status of things for generations, the enormity and significance of this picture often passes unnoticed and unconsidered by most Americans. But in our current economic crisis, and with mounting friction caused by imperial edicts emanating from federal agencies, many citizens and state and local governments are being forced to reevaluate our unbalanced federal relationship. Our Founding Fathers did not intend for new territories that would be admitted to statehood in the future to be unfairly shackled by the central government; they would not have countenanced that the people of Nevada, Utah, Idaho, and Alaska, for instance, would be groveling under the thumbs of politicians from New York, Massachusetts, and Pennsylvania. As Joe Wolverton noted in a recent article for The New American, they intended for future states to be admitted into the Union on a “equal footing” with the existing states. They most certainly did not intend for politicians of the Eastern states and federal bureaucrats to enjoy a stranglehold on the lifeblood of the people of the Western states. And as those politicians and bureaucrats continue to tighten their chokehold on the people who own and work the land, there will inevitably be conflict. Even peaceful, law-abiding people will not stand idly by while their own life’s work and that of their forebears is being taken by lawless officials. 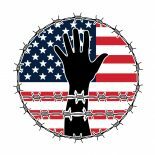 The solution is for the American public to put pressure on all their elected officials — state, local, and federal — to stop strangling our fellow citizens. Ultimately, that means decentralizing, and dramatically downsizing (and then abolishing) many of these agencies and returning the land to the states and the people. The people of the Western states must be allowed to determine their own futures, to enjoy the blessings of liberty, just as Americans in all the other states have experienced. This entry was posted on April 16, 2014 by conspiracyanalyst in Tyranny, US News and tagged Cliven Bundy.